If you have been charged with a crime in Colorado you may be frightened, confused, and looking for answers. I have developed this site and several others to provide you the information you need now. You are probably searching for two things – answers to your questions and an experienced Colorado criminal defense lawyer. While you are doing your research – you will need to know your rights under the criminal laws of Colorado and under Federal law. You must act NOW to protect those rights and you must act now before the witnesses’ memories fade, key evidence is lost, or witnesses can no longer be locate. Do your research but do NOT delay making up your mind – the longer you wait – the less time your attorney has to find the key facts or assert the key tactics necessary to obtain the best possible defense… Whether you retain me – or another qualified lawyer in Colorado – act now – to make certain your defenses are preserved. Like medicine, and architecture, like accounting and auto mechanics – there is no substitute for experience. But unlike those fields – and perhaps more than any other area of law, experience in the courtroom is crucial for an attorney representing individuals in criminal cases. Your freedom – the very fabric of our present and future life is at stake. This is no time to look for a bargain. My fees are more than reasonable – but what you should focus on is a lawyer’s qualifications – mistakes here may be life changing. The down side of incompetence or inexperience in a criminal case are particularly devastating to the client and there will never be a substitute for daily experience in the criminal courts of Colorado –day after day, week after week and year after year. 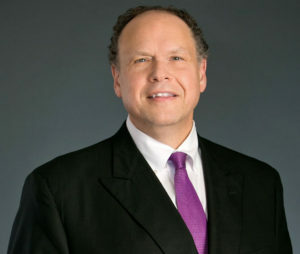 H. Michael Steinberg has been practicing exclusively Colorado Criminal Law for over 30years – about half of those years as an Arapahoe – Douglas County Senior Career District Attorney (DA). Then founding his own law firm – the Steinberg Colorado Criminal Defense Law Firm for the second half of those 30 years. 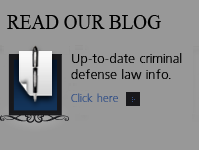 If you or a loved one has been arrested and charged with a crime in Denver or anywhere along the Front Range of Colorado, or learned that either of you is the subject or target of a Colorado state or federal criminal investigation, the most important decision you can make is deciding who will represent you in fighting against these charges….or in putting a halt to the investigation. Being accused of a crime is a very serious matter and having a criminal conviction on your record will have long-standing and devastating consequences for you and your family. 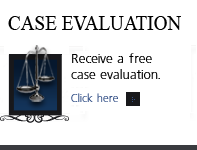 • Has successfully represented people accused of wrongdoing for many years and has seen every situation more than once. • Will assure you and your family that you will receive the kind of personalized attention and care that you deserve. “My name is H. Michael Steinberg and over the last 35 years, I’ve built a well-established and solid reputation as a skilled Denver Colorado criminal defense attorney among my peers, prosecutors, and the judiciary in the Denver metropolitan area . More important though, is the reputation I have with my clients. During my three -plus decades of practice, I’ve represented, and quite frankly, prosecuted as a career prosecutor-DA , thousands of clients in criminal defense matters in the Colorado state courts. 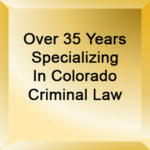 I therefore have a thorough knowledge of Colorado criminal law from both sides of the courtroom. My clients have been accused of every possible crime in the Colorado Criminal Code, ranging from the most serious charges (such as murder, drug trafficking and sexual assaults) to white collar crimes (such as conspiracy, mail, wire and insurance fraud, and racketeering). Clients with misdemeanor charges like shoplifting and driving under the influence receive the same attention as those charged with the most serious crimes. I do not assign my cases to a young associate. It is my law firm, and I take the care to personally handle every matter through conclusion. You will communicate with me at every stage of the case. No one else. Period. In a number of cases, I have become involved at such an early stage of the investigation, that I was able to convince the authorities not to charge my clients at all. But most important, I know that to a client and their family, all criminal charges are serious matters, no matter how minor they are. Every case and every client deserves an attorney who will do everything possible to gain a dismissal, a reduction of the charges, or if possible an acquittal of the charges. That is exactly what I promise to do for you–do everything possible and do it for a reasonable fee. • Fraud, Forgery, Theft and related offenses. • DUI and Vehicular Homicide and Assaults. I fight for my clients regardless of where they live or where they’ve been charged. I practice in Denver, all over the Front Range, and throughout Colorado in both state and federal courts, including all of the surrounding counties: Adams, Arapahoe, Douglas, Jefferson, Broomfield, Boulder, Larimer, Denver, Elbert, Gilpin, Lincoln, Park, El Paso. If you should need a seasoned, experienced, and successful Colorado criminal defense attorney, please contact me using the contact form to the upper-left, or call me at 303-627-7777 during regular business hours. If it’s after normal business hours or on a weekend, call me at my 24-hour emergency line: 720-220-2277 (my cell) or 303-543-4433 (my 24-7-365 pager) or both. Most often, I will call you back immediately or within a few minutes. • H. Michael Steinberg has repeatedly appeared on Wolf Blizter Reports on CNN and is a criminal expert for Rick Reilly, Senior Sports Writer for Sports Illustrated. • H. Michael Steinberg has appeared on Greta Van Susterne’s “On the Record” show as an expert on criminal sexual assault crimes in Colorado. H. Michael can be found every day in the courtrooms of the Front Range. He is rarely in his office in the Denver Tech Center; rather, you will find him almost exclusively in the courtrooms of the Front Range where he advocates on behalf of his clients in Denver, Jefferson County, Arapahoe County, Adams, El Paso, Douglas, Larimer, Boulder, Weld and nearly every county and judicial district in the state of Colorado. If a lawyer limits his or her practice to one area of Colorado Law as I have for the last 30 plus years, they become authorities in that area. They study the nuances and changes in that law and they can stay focused on the myriad ways to defend their clients. Honing their skills in the courtroom and the law library ( now online of course ) they work at the two key levels of success – experience and knowledge. It is at this point in their career that they are the most successful. H Michael Steinberg, is a Denver, Colorado criminal defense lawyer with over 35 years of day to day courtroom experience – specializing in Colorado Criminal Law along the Front Range. He will provide you with a free initial case consultation to evaluate your legal issues and to answer your questions with an honest assessment of your options. Remember, it costs NOTHING to discuss your case. 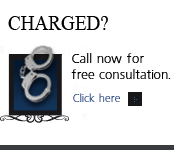 Call now for an immediate free phone consultation. Colorado Defense Lawyer H. Michael Steinberg provides solid criminal defense for clients throughout the Front Range of Colorado – including the City and County courts of Adams County, Arapahoe County, City and County of Boulder, City and County of Broomfield, City and County of Denver, Douglas County, El Paso County – Colorado Springs, Gilpin County, Jefferson County, Larimer County, and Weld County,…. and all the other cities and counties of Colorado along the I-25 Corridor..